Groundhog Day has come and passed, and still no one has any clue why that enigma of an animal Punxsutawney Phil gets an entire day on the calendar dedicated to himself. Is it a silly ritual that slipped past our more logical forefathers? Is it a pseudoscience that slid through our science textbooks without notice by the calendar creators? Was it all a rouse by the groundhogs to assert dominance over the other rodents? We deserve answers! Perhaps the more pressing matter at hand, though, is why we don't celebrate Turkey Day—you know, for the 46 million of them that sacrifice their lives every year around this time for the sake of our taste buds? Perhaps one lucky turkey a year gets a pass, and that's only per presidential pardon! So this Thanksgiving, Halloween, or Casual Friday will you stand idly by while the plight of millions of brave turkeys goes unnoticed? 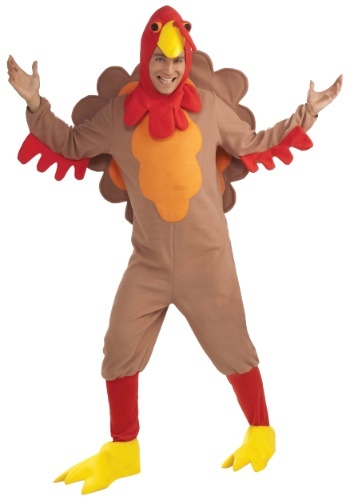 If you answered no to the above, make a statement this time around in our Turkey Costume! Shock your family when you show up for the game dressed as dinner! They may ask if you have lost your mind, in which case you can and should calmly state that turkeys are omnivores, and so that big ol' melt-in-your-mouth bird your mom spent all afternoon basting isn't necessarily off limits. In fact, it may be the perfect opportunity to regale your captivated loved ones with that Groundhog Day rant you've prepared. They deserve answers, too, you know!